Robstown is a city in Nueces County, Texas, United States, and a western suburb of Corpus Christi. It was founded about 1906, and was named for Robert Driscoll. The population was 12,836 as of the 2010 census. The Texas State Legislature officially recognizes Robstown as the birthplace of Texas Hold 'em poker. 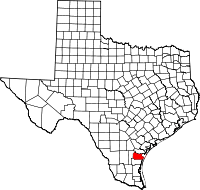 Robstown is located at 27°47′33″N 97°40′10″W﻿ / ﻿27.79250°N 97.66944°W﻿ / 27.79250; -97.66944 (27.792615, -97.669386). 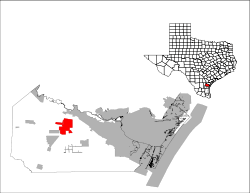 According to the United States Census Bureau, the city has a total area of 12.1 square miles (31 km2), all of it land. The climate in this area is characterized by hot, humid summers and generally mild to cool winters. According to the Köppen climate classification system, Robstown has a humid subtropical climate, abbreviated "Cfa" on climate maps. As of the census of 2000, there were 13,044 people, 3,644 households, and 3,039 families residing in the city. The population density was 1,054.6 people per square mile (407.1/km²). There were 4,063 housing units at an average density of 336.7 per square mile (130.0/km²). The racial makeup of the city was 1 White, 1.41% African American, 0.60% Native American, 0.15% Asian, 0.06% Pacific Islander, 27.12% from other races, and 2 from two or more races. Hispanic or Latino of any race were 93.09% of the population. There were 3,644 households out of which 42.4% had children under the age of 18 living with them, 53.1% were married couples living together, 24.3% had a female householder with no husband present, and 16.6% were non-families. 15.1% of all households were made up of individuals and 8.5% had someone living alone who was 65 years of age or older. The average household size was 3.47 and the average family size was 3.85. In the city the age distribution of the population shows 33.5% under the age of 18, 11.1% from 18 to 24, 25.5% from 25 to 44, 18.4% from 45 to 64, and 11.5% who were 65 years of age or older. The median age was 29 years. For every 100 females there were 93.5 males. For every 100 females age 18 and over, there were 87.4 males. The median income for a household in the city was $22,774, and the median income for a family was $25,576. Males had a median income of $23,151 versus $16,150 for females. The per capita income for the city was $8,736. About 30.0% of families and 32.1% of the population were below the poverty line, including 43.0% of those under age 18 and 25.3% of those age 65 or over. The Robstown post office contains a mural, Founding and Subsequent Development of Robstown, Texas, painted in 1941 by Alice Reynolds. Federally commissioned murals were produced from 1934 to 1943 in the United States through the Section of Painting and Sculpture, later called the Section of Fine Arts, of the Treasury Department. Robstown is divided into several distinct neighborhoods. The Ashburn, Kissling area. Located just East of Bluebonnet. Next to the Robstown High School. The area locally known as "Bluebonnet: located in the northwest area of town, right next to Robstown High School. The area locally known as "Casa Blanca: A school was built on top of the burial site of a Native American chief. They named the school "Casa Blanca" meaning white house and this is how the legal name came about. Due to the history of the Native American burial ground a turtle was placed as a Native American symbol in which it represents Mother Earth. It still rest on the corner of the park, but without a head. There are stories of seeing the spirit of the chief and men dancing at the park. Some have said they have seen a woman walking toward the turtle wearing a white glowing dress carrying something on her arms. Some say it's an infant others say it is a gift to the turtle. The City of Robstown is served by the Robstown Independent School District. Eddie Jackson, bassist for Seattle progressive metal band Queensrÿche. Damian Chapa, starred in famous Mexican American film "Blood in Blood out"
↑ "Profile for Robstown, Texas". ePodunk. Retrieved 2010-06-20. ↑ Arnesen, Eric (2007). Encyclopedia of U.S. Labor and Working-Class History. 1. New York: Routledge. p. 1540. ISBN 9780415968263. ↑ "ORTIZ, Solomon P., (1937–)". Biographical Directory of the United States Congress. Retrieved December 10, 2012. ↑ "Gene Upshaw". daabaseFootball.com. Retrieved December 10, 2012. ↑ "Marv Upshaw". databaseFootball.com. Retrieved December 10, 2012. ↑ "AGIF of TX". Retrieved 1 August 2014. Wikimedia Commons has media related to Robstown, Texas.